If there were grades given out for effort or such a thing as “moral victories,” Cal game close to scoring both Saturday in Palo Alto. The problem is at the end of the day, Stanford still has the Axe, is still in the running for a second straight BCS Bowl berth, and Andrew Luck still has another year of eligibility left. Bears fans appreciate the effort throughout the game and both the offense and defense battling deep into the 4th quarter. Even if the thought of victory was faint, you can see how badly the offense wanted to get into the end-zone on the last possession. What if Isi hadn’t fumbled on the second play of the game and dug Cal into an early 7 point deficit? 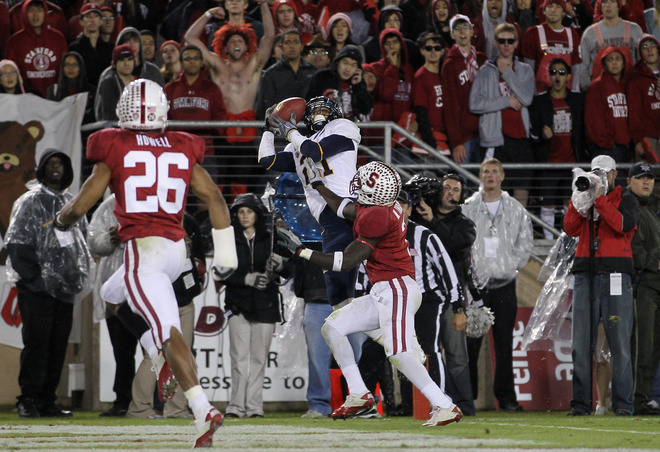 What if Jeff Tedford decided to go for it instead of taking a field-goal early in the game? What if the questionable fumble hadn’t been ruled on Isi near the end of the 3rd quarter? What if Keenan Allen didn’t go more than 2+ quarters without touching the ball? Cal showed a lot of guts and heart during this game. However, it is clear good quarterbacking from Zach Maynard is not enough to cover up mistakes from the running game and somewhat shaky defensive play throughout the game. A Cal victory would have made it 5 defeats for the AP top 10 and a historic week in college football. However, the Golden Bears are going to have to get ready for a Friday night game in Tempe against struggling Arizona State and the gratitude, presuming Andrew Luck leaves, that they will be favored to return the Axe to Berkeley in 2012.